This year, thousands of physician assistants, physician assistant students, and healthcare professionals will make the trek out the Mountain West. In this short period of time, the American Academy of Physician Assistants (AAPA) National Conference will be taking place in Denver, Colorado. This event is a staple for many healthcare providers to attend annually to get up to date on some of the newest changes in medicine, as well as an opportunity to meet with colleagues nationwide, or even catch up with classmates and other alumni from one’s specific physician assistant program. This year's AAPA conference will be held at the Colorado Convention Center in downtown Denver, Colorado from May 18th, 2019 to May 22nd, 2019. This national conference location varies from year to year. Over the past several years it has been held in Boston, MA (2014), San Francisco, CA (2015), San Antonio, TX (2016), Las Vegas, NV (2017), and New Orleans, LA (2018). Future locations for the AAPA conference will be in Nashville, TN (2019), Philadelphia, PA (2020), and Indianapolis, IN (2021). The cost of the conference has many variables. These include if you are planning on registering for the entire conference, or just a single day. Another big price changer is how early you register for the conference and if you are a member of the AAPA or not. 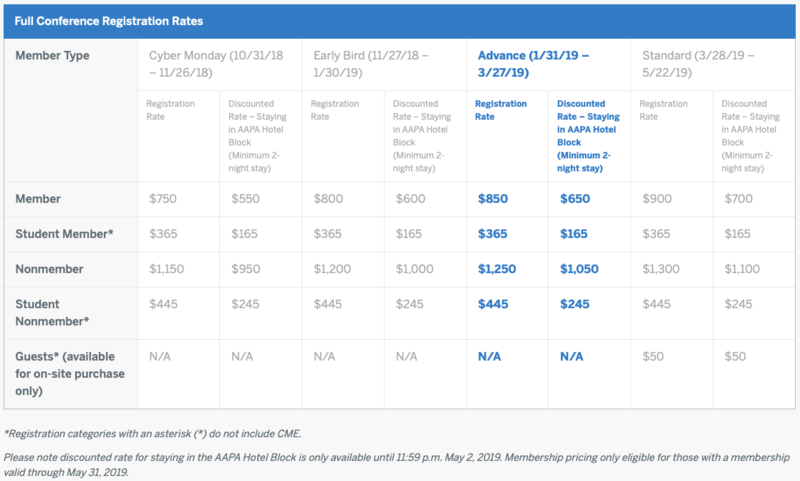 Example being if you are an AAPA member and you registered from October 31st through November 28th the cost of the conference would have been around $750.00; however, if you waited until January 31st through March 27th, the price has risen to $850.00. There are some discounts for the conference as well. If you an International PA, International PA student, Pre-PA student, if you are on the House of Delegates, if you are a Federal, Uniformed Service Member, or Veteran PA, or if you are a Constituent Organization Executive you may be eligible for discounted rates. When you pay the conference registration what do you get? Well, you get the opportunity to collect up to 200+ hours of CME (more on this later), admission to the general session of the AAPA conference, access to the exhibition hall, daily 45-minute product presentations, alumni and networking events, and access to additional paid events and workshops. There are hundreds of events that are held at the annual AAPA Conference. Some of these are events where you can gain CME as a clinician and others do not award CME credit. This year there are two-hundred and twenty events where you can acquire continuing medical education hours. These vary from events on Pediatric ENT, Acute Abdominal Pain Evaluation, Administrative Communication, Malpractice, Burnout, Osteoporosis, Point of Care Ultrasound Use, Stroke Management, to Autism Spectrum Disorder and Liver Function Tests and Hepatitis. Over the duration of the AAPA Conference, there are 275 hours of Category 1 CME in 46 categories offered. To be eligible to earn these continuing medical education hours, one must be a practicing physician assistant or have graduated from an accredited physician assistant program. If you are unable to attend this year’s conference in Denver, but still want to view the content and gain some of the CME hours, you can purchase the AAPA conference on demand, where you will have access to a digital library of the presentations. With this option, you can acquire 125 CME hours and will have access to the content after July 15th, 2019 and CME availability until June 30th, 2019. The exhibition hall at the AAPA Conference is a place that is always frequented by clinicians and students. This tremendous event area will be littered with hundreds of pharmaceutical company representatives, medical product companies, hospital and large healthcare companies, as well as educational and board review booths. This area is a fantastic way to learn about novel medications, medical devices, and also potentially network with healthcare companies about potential career openings. There is also the opportunity to get a ton of free medical information, advertisement items, and purchase textbooks or PANCE/PANRE review items. The national AAPA Conference is additionally a platform for practicing clinicians, physician assistant faculty members, and physician assistant student to display new research, clinical case studies, and clinical research. This portion of the conference can be easily missed or glossed over, so make sure to search them out. These presentations may include groundbreaking research on medical disease or advances, research on physician assistant education advancement, or interesting, rare, and unique medical cases that might keep you on your toes or prepared in your own clinical practice. This event additionally has a subset of students from physician assistant programs and allows them to present their research or case study, allowing budding minds to get their first experience in the field of medical research presentation at a National Conference. One of my favorite parts of the AAPA conference is the Challenge Bowl. This takes place on May 20th at 7:00 pm, and is essentially a medical game show for physician assistant students. Each physician assistant program has the opportunity to field a team of students in this competition. 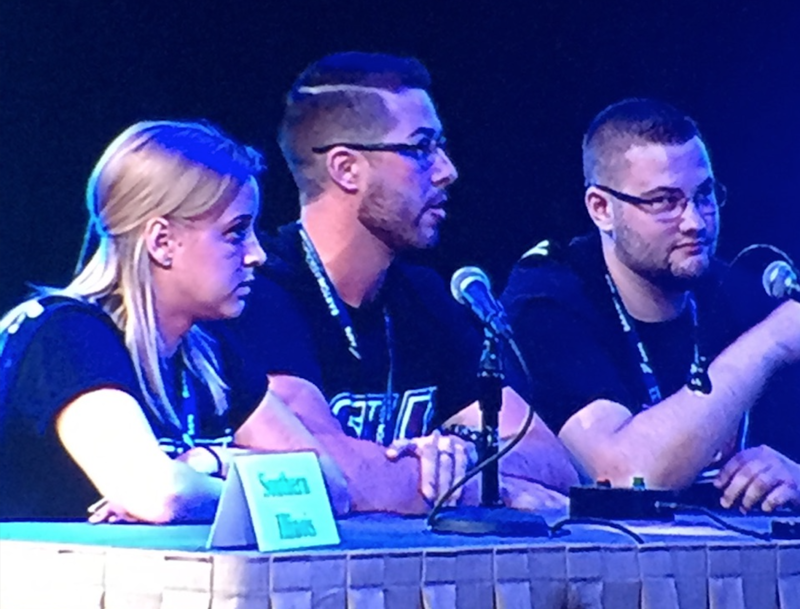 I had the opportunity to be a part of our Challenge Bowl Team at the AAPA Conference in 2016 at San Antonio, Texas. It was an excellent opportunity to be a part of, and something that I am eager to be a spectator at this year’s conference. 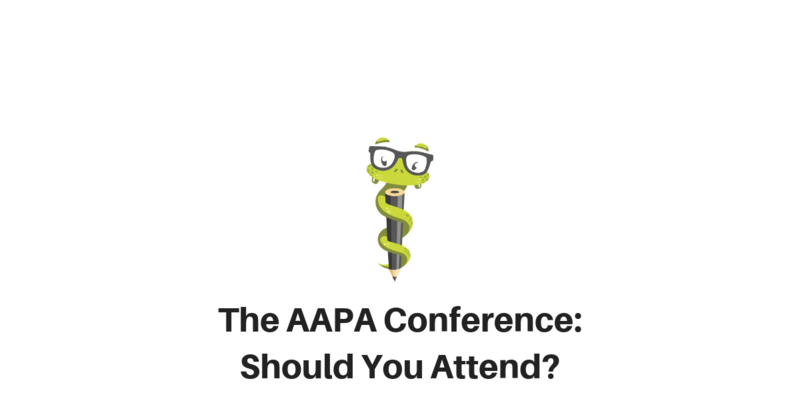 So, if you attend this year’s AAPA Conference, make sure to pack an extra shirt with your school’s logo and cheer the students of your former physician assistant program on! I hope this article sheds some light on the upcoming AAPA Conference in Denver, Colorado. I am eagerly awaiting the 18th of May to attend this conference. If you are attending this year’s conference and you see myself or any of us from Medgeeks, reach out and say Hello! We would love to hear from you, listen to your feedback, and make what we are doing better for you all. Until next time!